Epilepsy is a common, chronic neurologic disorder characterised by recurrent, unprovoked seizures. Although most seizures stop within a few minutes, prolonged seizures (status epilepticus) can develop if normal mechanisms of seizure termination fail. Status epilepticus can cause substantial neuronal death within various brain structures, including the hippocampus. Brief or repeated mild seizures delivered prior to status epilepticus can, however, serve as preconditioning, thus rendering brain regions temporarily less susceptible to damage. Epileptic tolerance has been demonstrated using a variety of seizure-preconditioning paradigms, including electroconvulsive shocks and low doses of excitotoxins such as kainic acid. Transcription factors, growth factors and apoptosis-associated genes have been implicated. Transcriptome profiling has further revealed a novel genomic response which, like that of ischemic tolerance, features predominantly gene downregulation. The affected processes include transport, calcium signalling and neurotransmission, suggesting epileptic tolerance is acquired via generation of an anti-excitotoxicity phenotype. This chapter summarises the various animal models of epileptic tolerance, proposed effector(s) and future challenges in what has become an important experimental tool for identifying novel targets for neuroprotection and anti-epileptogenesis. 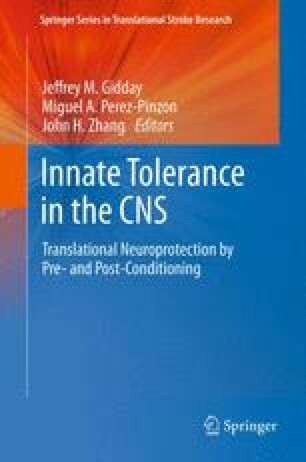 Chapter as part of a book entitled Innate Neuroprotection for Stroke, part of the Stroke Book Series, Springer. The authors thank Martha B. Johnson and Roger P. Simon for support with comparative bioinformatics between ischemic and epileptic tolerance and Suzanne Miller-Delaney for careful editing. The authors wish to acknowledge the support of Science Foundation Ireland (08/IN1/B1875).